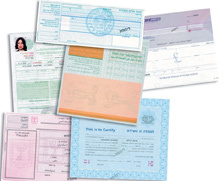 Be'eri Printers is Israel's leading company for the supply of a wide range of documents protected from forgery and counterfeiting: personal and commercial checkbooks, banking and foreign exchange documents, bank guarantees, securities, insurance documents, gift vouchers, and so on. Be'eri Printers is Israel's major security printer. Its vast knowledge and years of experience working with leading international companies – is at the service of government authorities', security and financial bodies, and commercial businesses.